Two identical 35' steel monkey figures were constructed on-site, during the demolition of a South Side industrial complex. The sculptures were completed by the Industrial Arts Co-op in the abandoned setting and exhibited in other locations; Zenith Emporium, the former Goodrich building in Akron Ohio, at the Heinz Regional History Center, Pittsburgh, PA. November 1996, and at the Fort Wayne Railroad bridge, Pittsburgh, PA. June 2001, Construction Junction - Present. 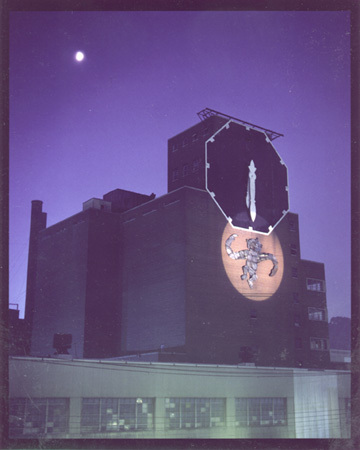 Pictured here at the clock tower of the former Duquesne Brewery, Pittsburgh, PA.